My first encounter with Falun Dafa was at the age of 31 in 2012. In a lifelike dream, I saw Master Li Hongzhi (the founder of Falun Dafa), and this experience made me feel a little overwhelmed. In the dream, I saw a group of disciples around an Asian master, listening to his teachings. I looked at them because I didn’t know if I could be one of them. However, the master turned and looked at me with compassion, and I realised that I could also listen to his teachings. It was not until years later when I read Zhuan Falun, the main book of Falun Dafa, that I understood what I saw in my dream. When I was 19, I decided to move from my hometown in Córdoba to the capital, Buenos Aires. I wanted to tell stories. So I chose to study film production, and my life was full of all kinds of stimuli, including alcohol and nightlife activities. In my career as a filmmaker, I directed a 35mm short film and was invited to an important film festival in Hollywood in 2003. This film festival was known as the prelude to the Oscars. There were strong signs that I would win the festival. But something happened at the last minute, and the winner was someone else. Based on the teachings of Falun Dafa, I now understand that everything in life is for a reason, and things that look bad may end up being good. No one can take what belongs to you, so I can forget the injustices, resentments, and embarrassments that I have encountered. Nevertheless, at the time, I was very disappointed and jealous, so I left everything and moved to my parents’ old riverside house in the Córdoba mountains. I remembered having a good time there during my childhood. However, the situation with the house was not as good as I’d expected: the environment was very bad, and there were no doors, electricity, or even toilets. Living alone in the mountains, I gradually realised that I had begun a path of spiritual exploration. I got rid of my desire for a superficial life in the city and tried to find myself in loneliness. However, finding the right path was not easy. I was constantly looking for and experimenting with different religions and beliefs. Then, I met my current wife. In fact, her friend gave me a copy of Zhuan Falun. When I read Zhuan Falun, I immediately understood everything I saw in my dream and decided to end my explorations. I immediately stopped my other forms of practice, including Buddhism, shamanism, and the thought of becoming a Catholic monk. From that moment on, my life changed forever. It was like reaching the highest point of spiritual exploration. This path had just begun. Looking back, I understand that it takes a long process to fully assimilate into Dafa, but this path will bring great happiness and joy. 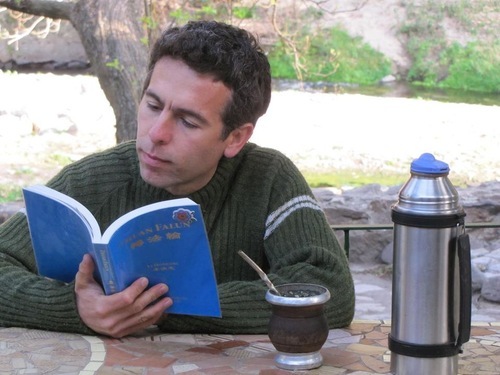 Ricardo Juri before practicing Falun Dafa. I feel that my life has always been related to movies and storytelling. I feel that everything I have experienced in my life has paved the way for me to accept Dafa more easily. The reason why I share this is that I have this feeling in my life, in a clear dream, in my life in Buenos Aires, in the trip to Hollywood, etc… I have always been a part of Master’s script. When I discovered the teachings of Truthfulness-Compassion-Forbearance, I felt that life was no longer empty, that I was no longer alone. I feel a kind of warmth. My vision of life seemed to be more pure and clear. The arrangement for each practitioner is different, and there are profound reasons behind it. Every detail, moment, change, and every step of cultivation is incredible, and everything happens at an exact moment and place. Since I attended the Falun Dafa Cultivation Experience Sharing Conference in Buenos Aires in 2016, I have made great progress in my practice. I have come to understand the importance of group study and following coordination. On my trip to this conference, a fellow practitioner pointed out that Falun Dafa teaches us the importance of returning to tradition and the true self. When we practice in the secular world, we need to adapt to it. This is a part of selflessness and letting go of self. 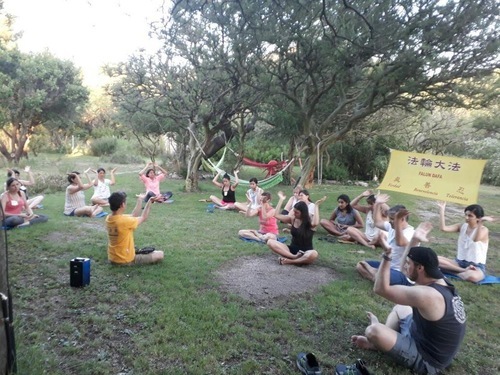 When I came back from the sharing conference in Buenos Aires, I was inspired by other practitioners and decided to increase my Fa-study time, strengthen my righteous thoughts, and spend more time talking to others about Dafa. I also started an exercise site in the town next to my home, where more people came to learn the practice and meditate. I also came to understand the importance of my appearance. 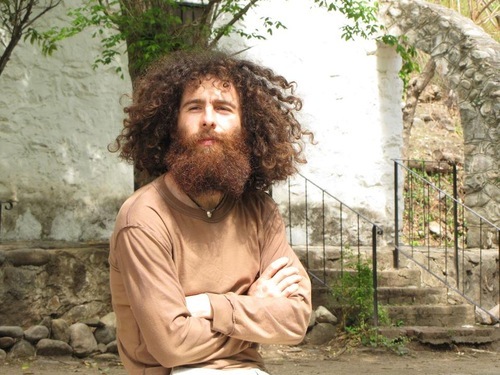 Previously, I was reluctant to get a haircut and went to the local Fa conference with long, messy hair and a big beard. In Buenos Aires, no one said anything to me, as they may have wanted to understand the new practitioner. But I later realised that they didn’t post any photos that included me, including a group photo of all the practitioners. After the experience sharing conference, my cultivation state improved, and I decided to change my image. I shaved my beard, cut my hair, and started wearing normal clothes. People who know me today cannot believe my changes. “Oh! You are like a new person,” my wife’s cousin said. “Hey, Ricardo took a shower!” said one of my friend’s children. People have changed their impression because Dafa has purified me, my thoughts, and my personality. It is surprising how internal changes are reflected externally. When I become more cheerful and talk to people, my true self emerges. With the help of Dafa, I came to understand the world as a great school that can train people. To do this, all practitioners must coordinate with one another. Master has left us with an example, a framework that allows us to support each other. There is not much time left, and we need to be more diligent now. However, in order to understand this urgency, I must eliminate many attachments. It’s hard to eliminate attachments, but it releases us in an indescribable way and immediately makes our thinking clearer. Shen Yun recently performed in my country. I went to the capital, Buenos Aires, to assist. There, I spent a lot of time with other fellow practitioners and learned a lot from the experience and sharing. I made great efforts. When we cooperated on this solemn project, I could feel the tremendous power and energy of Dafa practitioners as a whole. I even noticed that my words were more accessible to people. The Shen Yun performance was successful this year. But without good coordination, that would not have been possible. With the joint efforts of all fellow practitioners, the process was like an intensive lesson. But I could also feel the jealousy of a fellow practitioner for the main local coordinator of Shen Yun. This practitioner even enticed many fellow practitioners to stay away from true cultivation. He tried to unite those with other opinions against the main coordinator–not in a direct way but rather cunningly, even if he did not do so consciously. Some things saddened me, but I felt that meeting with this person was a crucial moment and test in my life. Because I read Zhuan Falun often, I could be strong, was able to distinguish between right and wrong, and did not follow him in his ways. I realised that in order to pass the most difficult test, we must be filled with the Fa as much as possible. Learning the Fa and learning coordination are the keys to being more diligent in our practice. Ricardo Juri (first on right) at a 2017 Falun Dafa event. For eleven years, I tried unsuccessfully to connect my home in the mountains to the Internet. Before practicing Dafa, I always wanted to watch movies and so on. But living in the mountains, without a phone, I was constantly told that it was impossible to connect to the Internet. A few months ago, a local practitioner invited me to participate in a media project that required an internet connection. I hesitated to agree at first because I couldn’t get online. Then, I understood that Master would now help me to connect with others through the internet in order to work on the Dafa project, not because I want to watch movies. I accepted the job. Incredibly, a solution appeared, and within a few months, I was online and had made a video and film for the media project for Spanish speakers around the world. The production was very successful. 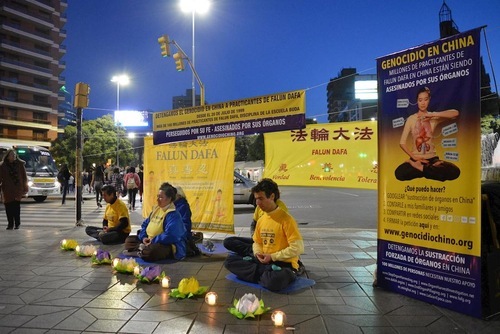 It takes immense effort to raise awareness of the terrible persecution of Falun Dafa practitioners in China since 1999. This shows that the more we assimilate to Truthfulness-Compassion-Forbearance, the more help and opportunity we will get as long as we have a wish to save people. Today, my wife and I live happily together in the heart of Argentina, in the picturesque town of Valle Hermoso in the province of Córdoba. Through the internet connection, I can establish closer ties with other practitioners. In order to study the Fa with fellow practitioners in Córdoba, 80 kilometers away, I travel a lot. This is not easy, but the effort always positively affects my cultivation. I am very happy to share my experiences, listen to the experiences of my fellow practitioners and how they overcome their difficulties guided by Dafa. I constantly strive to strike a balance between society, family life, and cultivation. I have experienced many positive changes in the process. Today, I seize every opportunity to inform people about Dafa and the persecution. Although I have been very reluctant to use social media, I decided to let go of this reluctance because of the persecution of Falun Dafa, because it should be used to our advantage to clarify the facts online. My wife has witnessed all the changes in my body and mind. She supports my practice and sometimes even studies and does the exercises with me. I believe that she will also cultivate seriously in the future. It was not until Falun Dafa entered my life that I found stability and specific tools to improve myself. I always try to find the right time, the right words to say to people. The better I practice, the less I struggle, and the more likely opportunities to communicate will naturally come along. Surrounded by natural fountains and clear rivers, I opened a small hotel in the house on the hill. Together with my wife, we warmly welcome guests around the campfire and have pleasant walks in the Cordoba Mountains. Since I started practicing Falun Dafa, I have noticed a profound change in my relationship with our guests. For example, in the past five years, we have established a close relationship with “La Casita de la Nona” (the Grandmother’s House), which houses children from difficult families. In the past five years, children from Buenos Aires have come to our cabin in October to enjoy their summer. Two years ago, I decided to teach Falun Dafa to the children. They are very enthusiastic! Nona (‘Grandmother’ in Italian), the guardian of Grandmother’s House, encouraged me to continue to teach the children Falun Dafa. Next to the campfire, I told the story of a fool and a clever person. Every child thought that the clever person was the winner, but I said the opposite was true. I explained to them that the fool was gaining virtue and that the clever person was losing it. I found that this was the way to teach them the importance of karma and de (virtue) so that they can follow the principles in their daily lives. Teaching children to practice Falun Dafa. Why Did We Come to This World? Today, I do not plan to make films for fame or recognition. Now I help others find their way and save people. We are here for Dafa. All paths of practitioners, no matter how big or small, are always taken care of and guided by Master. We only need to trust Master and do as much as we can. Even if happiness is redefined, we begin to enjoy life from different angles. Once we assimilate to Dafa, everything in life is for Truthfulness-Compassion-Forbearance, and we can find the real purpose of becoming a human being today.